SKU: MXCB1B001T4001FIPS. Categories: DataLocker External Hard Drives, IronKey. Strong password authentication thwarts unauthorized access, and a high-strength aluminum enclosure resists physical break-ins and lets you recognize immediately any attempt to compromise the drive. With the first USB external hard drive to be FIPS 140-2 Level 3 validated*, you can be confident you’re meeting regulatory requirements by deploying the highest level of encryption, powered by the on-board security processor. 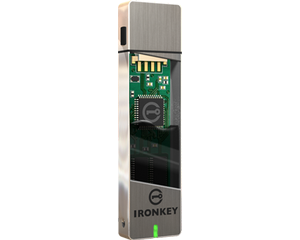 AES-256 hardware encryption makes the IronKey H100 External Hard Drive perfect for storage of the most sensitive data. Use Imation SafeShare technology to allow users to collaborate using on-device data, but without compromising its security. ** 1 GB = 1,000,000,000 bytes. Some capacity is used by the security software and is not available for storage. ***1 TB = 1 099 511 627 776 bytes. Some capacity is used by the security software and is not available for storage.